Whenever you purchase a new vehicle, or an expensive piece of electronic equipment, you are almost always offered the opportunity to purchase an extended warranty. Many times the extended warranty is not worth purchasing. For instance, what is the point in purchasing an extended warranty on a vehicle when that warranty doesn’t cover many of the things that tends to break down during the warranty period? People tend to be very skeptical about extended warranties, but is it worthwhile to get an extended warranty for your inflatable water slide? Before you can answer back question you need to know what the warranty is going to cover. For starters, do not expect the extended warranty to cover the blower’s and the accessories. These are often covered by a separate, standard warranty and are handled directly through the manufacturer of those pieces. What you are likely to find when it comes to inflatable extended warranties is that the warranty company will pay a certain percentage to replace your unit, and while the coverage starts at 100% it deteriorates over time. For instance, you may get an extended warranty that covers 100% of the cost of the unit for up to two years but, after those two years the coverage drops to 50 or 60%. It is also important to note that most manufacturer extended warranties will replace the unit exactly or, if that exact unit is not available, will replace it with a similar product that is either of equal, or greater value. Most of the time it is necessary to purchase extended coverage within 30 days of the original date that you purchased the inflatable water slide, but you may be able to get coverage later on in the life of the unit with the right program, although you will likely have to pay a fairly steep fee to do so. Is getting an extended warranty worthwhile? It really depends upon how long you plan on keeping the bounce house units that you have purchased. If you only plan on keeping the unit’s for three years or less then it may not make sense to purchase an extended warranty. If, however, you plan on keeping the unit for a much longer amount of time in purchasing an extended warranty made definitely be a good idea. Every bounce house rental business owner goes through a quiet time when their business is not busy. Instead of looking at this as a detrimental time, it is a good idea to look at this time as the perfect opportunity to structure your business plan for the upcoming year. We call this the annual clean out. Before you even think about looking at that new inflatable waterslide for sale of your preferred bounce house manufacturer, you first need to go through all of the product you currently have and come up with a new business plan for the upcoming year. It is extremely important that you first inspect all of your existing equipment. In order to do this you will need to have a large, flat area where you are able to inflate all of your units individually so you can check them out thoroughly. Expect this phase to take roughly one full day, more than one day if you own a large number of units. Inflate all of the units that you own, one at a time, and check to make sure there are no rips, tears, or seriously rubbed areas that need to be patched. Use this time to check all of the hoses and the blower’s as well to make sure they are all imperfect running order. It is also a good idea to thoroughly clean all of your units at the same time. Once you have inspected all of your current units you can then decide which units you are going to keep, which ones you’re going to sell, and which new units you are going to purchase. If, for instance, you want to buy an inflatable waterslide for sale that you have seen it is a good idea to make sure that you have enough room for the unit by selling older pieces that do not read well. Want your garden all of the physical inspection over with it is time to work on the business aspect of your bounce house rental business. Make sure you get a new quote on your insurance and that you check out your pricing strategy and your marketing plan to see what worked last year, what didn’t work, and to make notes about all of the things you want to implement this year. By doing this procedure once a year you will find that your business only improves. One of the biggest things that you need to take note of when you own a bounce house rental business is what types of units your clients are looking to rent. 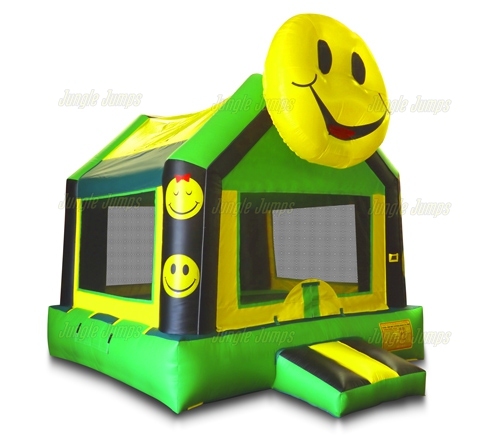 It doesn’t matter if you purchase what you believe is the most unique and fun bounce house unit available – if no one is renting it, it is not making you money. It may be a good idea to go online and look for a double inflatable slide for sale. This type of slide is extremely popular for a number of reasons and here we will discuss how it can help to make you money. One of the biggest reasons why the double inflatable slide is so popular is because it allows more than one child to play at a time. When you have a single slide you can have a couple children climbing up the ladder but it is recommended that only one child go down the time. 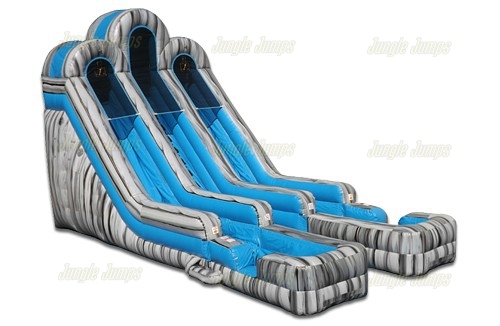 With the double inflatable slide, however, to children can be sliding down at the same time while other children are climbing up. This makes it easy to entertain 6 to 8 children at any one point in time. But not only should you look for a double inflatable slide for sale because it allows multiple children, you should also look for one because it allows for racing. The vast majority of kids love competition and absolutely love to challenge themselves and to see if they can beat their friends. With the double inflatable slide, they can. One child can start on one slide, the other on the other slide, and both children can be timed racing down the slides. To make this slide even more interactive you can purchase a red, green, and yellow light system from a variety of retailers that you can then set up directly in front of the slide. Press the button and everyone at the top of the slide will know when it is time to go down. There are many different ways you can customize a double inflatable slide to allow you to create a name for yourself in the inflatable world. Q: You have to spend a lot of money to start a bounce house rental business, right? A: One of the biggest questions people have when they start thinking about starting their own bounce house rental business is how much money they’re going to have to spend in order to get the business started. Some people believe that it is like a franchise, where you have to pay a specific amount of money in dues in order to own the business. The reality of the fact is that while you do have to spend some money to start your own bounce house rental business, and granted most of your money will go to the inflatable slide manufacturer that you will purchase your bounce houses from, it really does not cost a huge amount of money to start a bounce house business. Simply purchase the units, get insurance, and start a website and you’re ready to go. Q: Insurance? Do I really need insurance to start a bounce house rental business? A: The first thing you should do, even before you have picked which bounce houses and slides you will purchase from the inflatable slide manufacturer, is to look into insurance. Having insurance is extremely important as it protects you from being sued by your clients and also protects you rental items. Some new business owners believe that if they are simply careful they will not have to worry about having insurance, but accidents can happen at any point in time which is why it is extremely important to make sure you have insurance for your bounce house rental business. Q: I have to like kids to do this, right? A: Truthfully, most bounce houses are rented by parents to be entertainment at a child’s birthday party, so if you do own a bounce house rental business you likely will be around children. It is extremely important that you are comfortable around children, but you don’t have to like getting down on the floor to play with them to own a rental business. 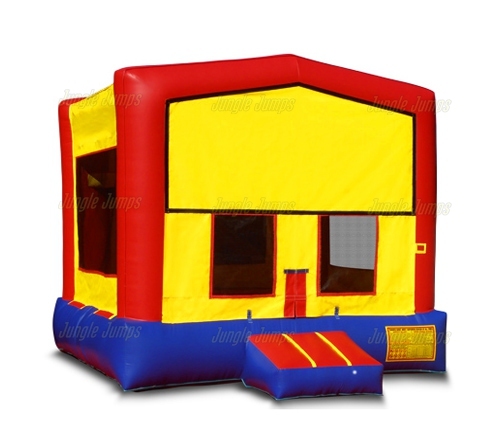 Remember: a vast majority of your clients will be parents renting the bounce house for the party which means you only have to set up and take down the unit minimizing the amount of time you’re around children. Q: How much time will I have to take off work to own this business? A: One of the smartest things you can do if you’re starting your bounce house rental business is to continue working while you start the business. It can take a few years for any new business to take off and having a steady income is the best way to remain financially secure. The good news, however, is that most of the time a bounce house we rented on a weekend which means if you work Monday through Friday job, you should have to take absolutely no time off of work to manage your business. When you first start renting units, no matter whether they be a bounce house or inflatable slide, things are very exciting. It’s normal to look forward to setting up, and taking down units for your customers. As time goes on, however, you will quickly find that while setting up doesn’t seem to be too much of a hassle, taking down the units gets more and more frustrating. If not because the units are difficult to take down, in fact most of them are extremely easy to dismantle, it simply that, well, they can be a boring job and the last thing you want to do in the evening hours is to you take down a bounce house. It can sound extremely appealing to leave the dismantling of the unit until the morning hours. Is it a good idea, though, to leave the bounce house up overnight? There are a lot of things that the inflatable slide manufacturer will tell you about your unit before, and after, you have purchased it. Many times the manufacturer will tell the new owner how much weight the unit can handle and how large the space you need to have in order to set it up. What they don’t tend to recommend is whether or not you should leave your bounce house up overnight. What do we believe? We feel that it is not a good idea to leave any bounce house running overnight and there are a few reasons why. Firstly, if you have any idea how much power it takes to run a bounce house for an extended period of time? The inflatable slide manufacturer will point out that it doesn’t take a huge amount of power to inflate the unit, and this is true. Believing it on for over 12 hours can make your electric bill rise significantly, and not only that they can also shorten the lifespan of the blower a great amount. Not only do you have to worry about electricity and the blower if you leave the unit up overnight, you also have to worry about late night visitors. Creatures find inflated units extremely appealing and if you’re fortunate enough to not have an inflated unit get nocturnal guests, you will most definitely find that it is full of bugs the next morning. 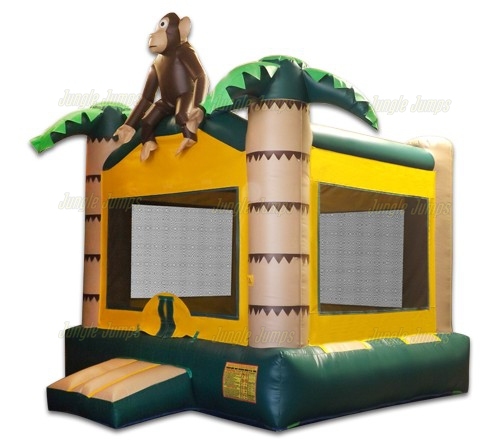 We think that it is better idea to dismantle the unit you purchase from the inflatable slide manufacturer as soon as the party is over rather than to risk it being damaged in any way.